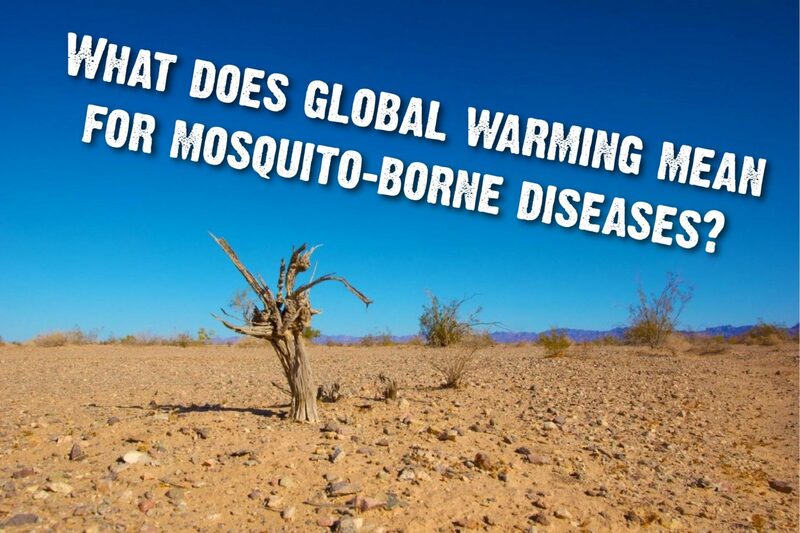 What does global warming mean for mosquito-borne diseases? Climate change is a term used to describe the changes in weather patterns that Earth has undergone over the course of history. Each of the last three decades has been successively warmer at the Earth’s surface than any preceding decade since 1850, and there have also been changes in rainfall and humidity, all of which can affect the life cycle of mosquitoes and as a result mosquito-borne diseases. Tropical mosquito species like those which transmit malaria, dengue and Zika mostly require high temperatures to complete their life cycles. This means that a possible result of areas warming due to climate change could be that tropical mosquitoes can develop more rapidly3. Despite this, there is for every species a temperature at which the mosquitoes cannot survive, a factor which must also be taken into account when considering the impact of temperature rise on mosquitoes acting as vectors. Humidity and rainfall changes are also climate indicators to consider. They can have different effects dependent on the disease being transmitted. For example, peak malaria transmission is often directly connected to increased precipitation during the rainy season, as the rain forms surface pools of fresh water which become favoured development habitats for the Anopheles mosquitoes that transmit malaria,. However it has also been observed that this rainfall can wash away larvae and eggs, as well as reduce the number of small puddles, both of which can temporarily lower the malaria transmission rates. A contrasting example to this is West Nile virus, which can have epidemics in drought. This is because mosquitoes and the birds they feed on are in close proximity at the more scarce water sources, meaning the virus can more easily be transmitted4. The mosquitoes also face fewer predators as the predator populations are often reduced in times of drought. An example from wetlands in Pennsylvania demonstrated that inducing drought in experimental habitats reduced natural predators such as larval amphibians and fish, thereby allowing the Culex pipiens and Anopheles quadrimaculatus to undergo rapid population growth5. These humidity and rainfall-based effects may result in a geographical shift in the affected area. This can be very dangerous as the human population in the newly affected area may not be naturally immune or possess the infrastructure to deal with any disease outbreaks. Overall, this means that a shift in the affected area can result in an increased morbidity and mortality. Whilst the challenges of climate change are a global problem, it is those living in developing countries that will be disproportionately affected, and may have the least means to overcome them. In addition to the damage caused by severe weather and rising sea levels, the importance of changes in climate on vector-borne diseases should not be overlooked1. Parham, P. E., Waldock, J., Christophides, G. K., Hemming, D., Agusto, F., Evans, K. J., … & Lenhart, S. (2015). Climate, environmental and socio-economic change: weighing up the balance in vector-borne disease transmission. Phil. Trans. R. Soc. B, 370(1665). Mabaso, M. L., Craig, M., Ross, A., & Smith, T. (2007). Environmental predictors of the seasonality of malaria transmission in Africa: the challenge. Am J Trop Med Hyg. 76(1), 33-38. Tanser, F. C., Sharp, B., & Le Sueur, D. (2003). Potential effect of climate change on malaria transmission in Africa. The Lancet, 362(9398), 1792-1798. Paull, S.H., Horton, D.E., Ashfaq, M., Rastogi, D., Kramer, L.D., Diffenbaugh, N.S. and Kilpatrick, A.M. (2017). Drought and immunity determine the intensity of West Nile virus epidemics and climate change impacts. Proc. R. Soc. B, 284(1848). Chase, J.M. and Knight, T.M., 2003. Drought‐induced mosquito outbreaks in wetlands. Ecology Letters, 6(11), pp.1017-1024. Campbell, L. P., Luther, C., Moo-Llanes, D., Ramsey, J. M., Danis-Lozano, R., & Peterson, A. T. (2015). Climate change influences on global distributions of dengue and chikungunya virus vectors. Philos Trans R Soc Lond B Biol Sci, 370(1665).